The second instalment of Man-Thing will soon be arriving from the creative minds of R.L. Stine and artist Christopher Mitten. All is not well for Man-Thing after returning in issue #1 from Hollywood to the swamp he once called home. 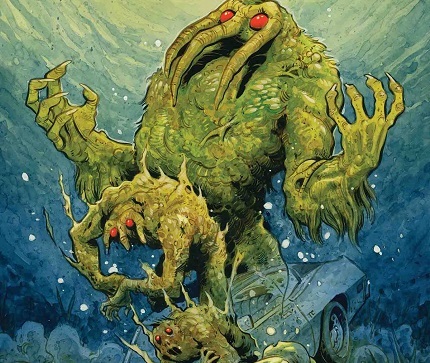 Man-Thing was one of many creations by Stan Lee, with Roy Thomas, Gray Morrow and Gerry Conway also being instrumental guiding influences in the character’s initial development. The swamp loving creature debuted in comic books back in 1971. R.L. Stine the acclaimed horror novel writer is lending his own unique vision to the Man-Thing character. Man-Thing is visited by an ally from his past, while struggling with his new status in life. But the swamp is less than welcoming, with every creature seemingly out to get him including the Crocodiles, bats and mosquitoes. Will Man-Thing be able to restore the balance of the swamp and the cause of this calamity? Or will the forces that are affecting the swamp prove to be beyond his control? Man-Thing #2 will be available in all good book stores at the end of March.